There are hundreds of accommodation options on Koh Lanta. You can choose to stay in guest houses, resorts, apartments, luxury villas or rent a Thai house. Most students pay 5 000 to 14 000 THB per month for accommodation but there are cheaper and more expensive alternatives. You can book your accommodation in the form below but it is not necessary to book in advance unless you arrive in peak season (December-January), have special requests or know exactly where you want to stay. There are always free rooms somewhere. 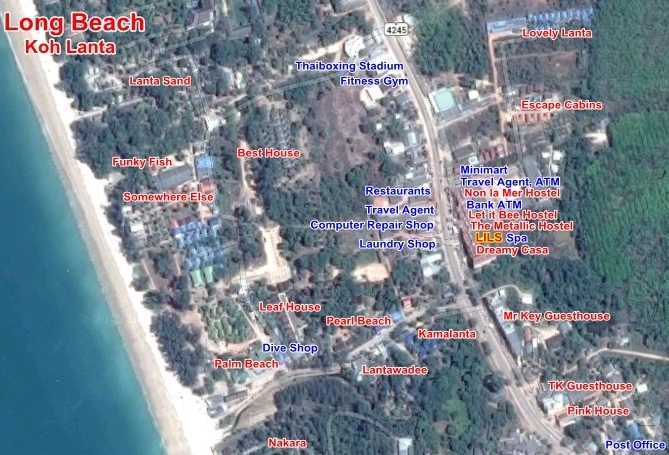 This is an overview of the accommodation options within walking distance of Lanta International Language School. Click on the picture for a larger version. Click here for a list of prices and contact details to the most popular places. The company Lanta Diver will take care of your accommodation request and get back to you with suggestions and prices. You can use this form even if you don't plan to study at LILS. Do you want to book transfer from the airport to your hotel? Select Yes, from Krabi. Yes, from Phuket. Yes, from Trang. Yes, not sure where from. No thanks.